I've been using yellow and grey in combination a lot recently - one of my favourite combo's! I had a lot of fun with this card! I used my "monochrome technique" but applied it to cardstock in a contrasting colour. 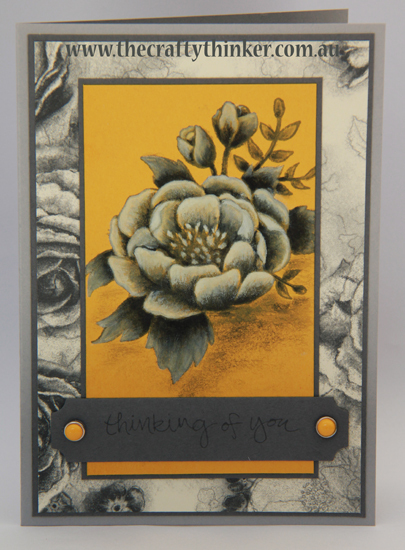 The Crushed Curry cardstock shows through the ink in places to form part of the flower colour. The inks are Basic Gray and Whisper White Craft. Given that the Basic Gray is an archival ink (and the water-resistant properties of archival inks), I wasn't sure that I'd be able to paint with it but it seems to have worked. I thought the Timeless Elegance DSP tied in very well with the feature flower. In addition to the Crushed Curry, I used Smoky Slate and Basic Grey cardstock. The greeting is from the Sheltering Tree stamp set. I attached It's My Party Enamel Dots to Candy Dot Brad bases for the finishing touch. To make a purchase click on any of the product images below.